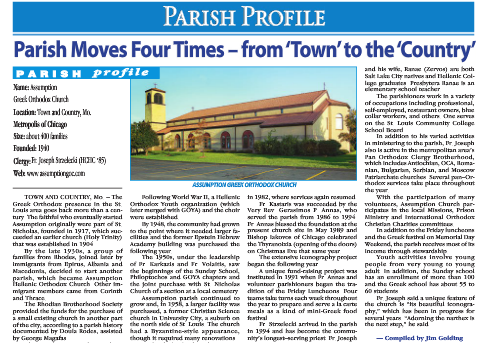 A Parish Profile for the Assumption Greek Orthodox Church in Town and Country, Missouri was published in the April 2014 edition of the ORTHODOX OBSERVER - on page 21 of 40. "The Greek Orthodox presence in the St. Louis area goes back more than a century. The faithful who eventually started Assumption originally were part of St. Nicholas, founded in 1917, which succeeded an earlier church (Holy Trinity) that was established in 1904. By the late 1930s, a group of families from Rhodes, joined later by immigrants from Epirus, Albania and Macedonia, decided to start another parish, which became Assumption Hellenic Orthodox Church. Other immigrant members came from Corinth and Thrace."